I have made a Patreon page. It’s a site for creators to find sponsors in order to spend more energy on creating and less time worrying about how to pay the bills. As part of making my page I clarified some goals for myself: I want to use more art beads (made by other artists) and I want to make more tutorials. I planned for the earrings above to incorporate both goals. 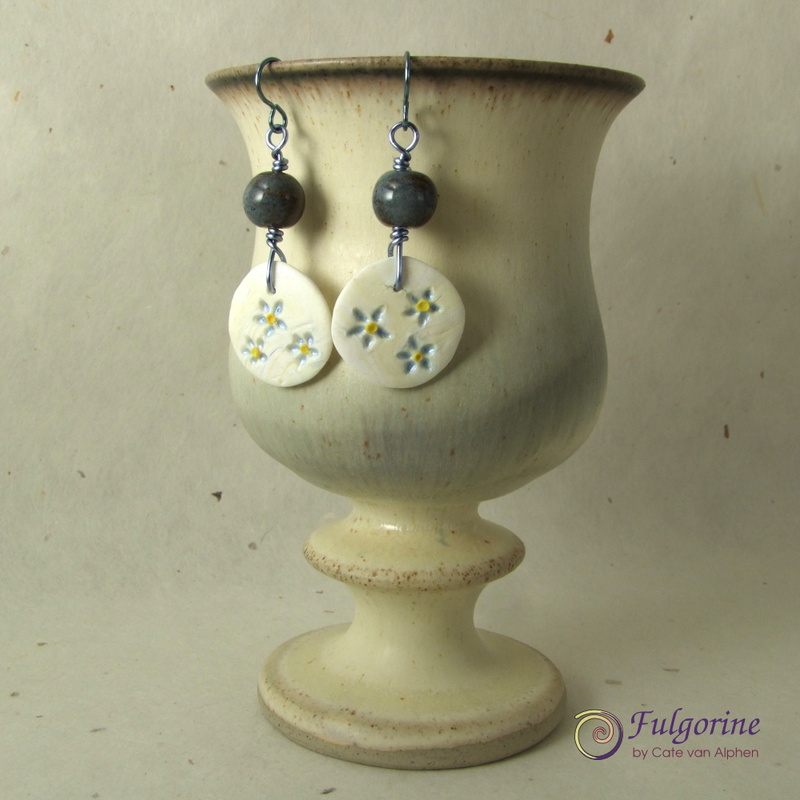 I’ve got the art beads: I made the ivory coloured floral disks from polymer clay and the blue ceramic beads are by Jenny Gholson-Morris. But the tutorial part: not so much. Making a video tutorial is proving more time-consuming than anticipated – I’m struggling to get footage that is in shot and in focus. Oh, right! This is why I set up the Patreon page in the first place – because at the moment I haven’t got much time for figuring this out. So until I can make a full tutorial, here’s a little tip. 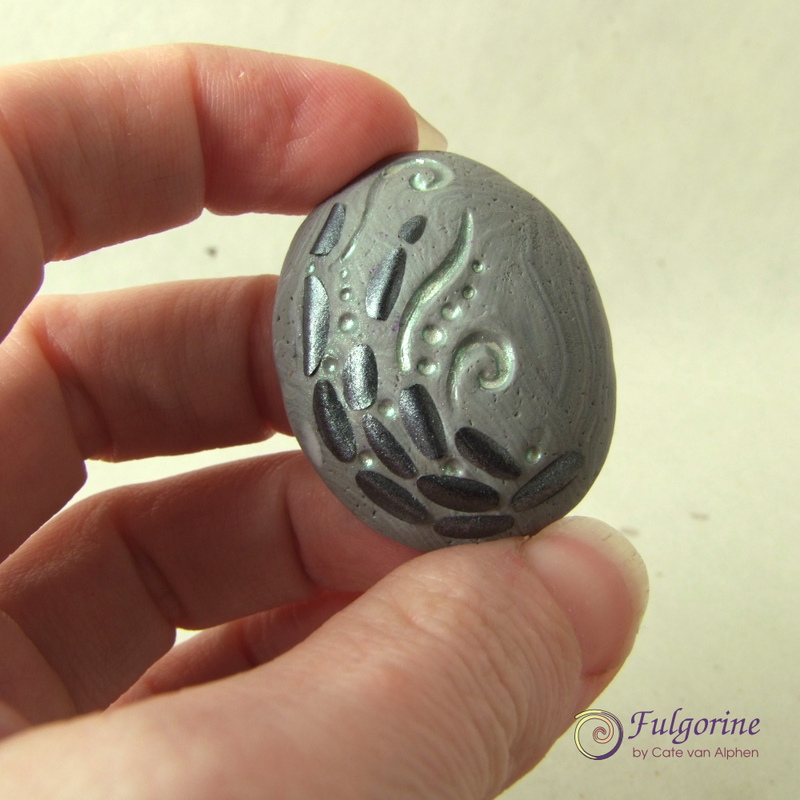 I made this cabochon as a way to use up the scraps from making carved beads. The muse wanted a matt concrete effect. My logical brain tells me this is to contrast with the shiny fragments. I wanted something more interesting so I drew in some scrolls and dots. I thought it still needed some subtle pep so I mixed green iridescent mica powder with a drop of water to paint into the dents. This caused the water (and mica) to puddle in the indentations and not all over the surface of the piece. I did the same thing for the petals of the flowers on the earrings. 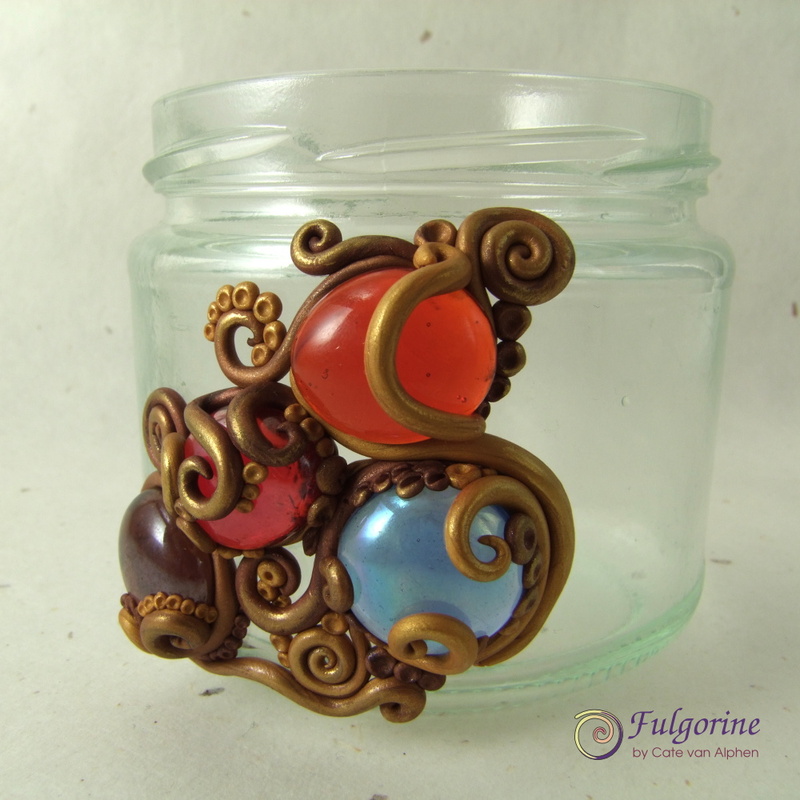 I used Perfect Pearls for this technique as it has a built-in resin and I painted it onto uncured polymer clay. It didn’t seem to stick as well when painted onto baked clay. By the way, if you would like to sponsor me, you can start from $1 a month and change your mind any time you like. I have finally found some time to work with polymer clay, even though I haven’t worked on a vessel. 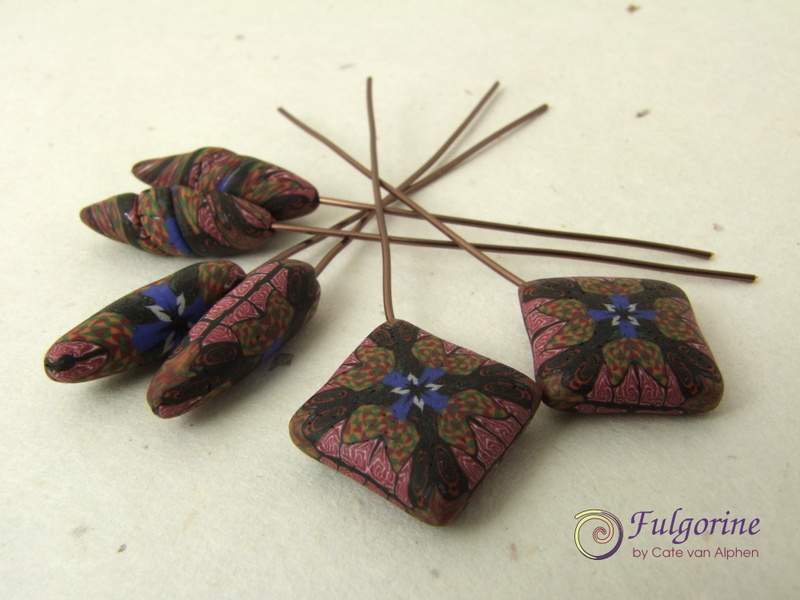 I have signed up for this month’s Art Jewlery Elements design challenge to make something using art headpins, so I have made some using a polymer clay kaleidoscope cane. I tried to make several of them so I’ll have the option of making something other than earrings (although I have already siphoned off one pair for earrings). 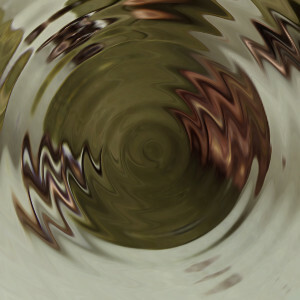 I also changed shape when I got bored ;). Come back on the 27th August to see what I make using them. In other news my Art Charms arrived today from Jennifer Cameron’s Fairy Tale themed swap, but you’ll have to wait until 16th September to see what I made for that. I’m really excited that Jen Cameron is doing another Art Charm Exchange this year. This year’s theme is “Fairytale”. I’ve already signed up :). Here’s what I made last time. Sign ups are open till the 9th May if you’d like to join in too. In exchange for making 11 charms (and paying for postage) you receive 10 charms back from the other participants. The 11th charm goes to auction to raise money for Beads of Courage. So it’s all for a good cause really – not at all because you get a stash of goodies back ;). 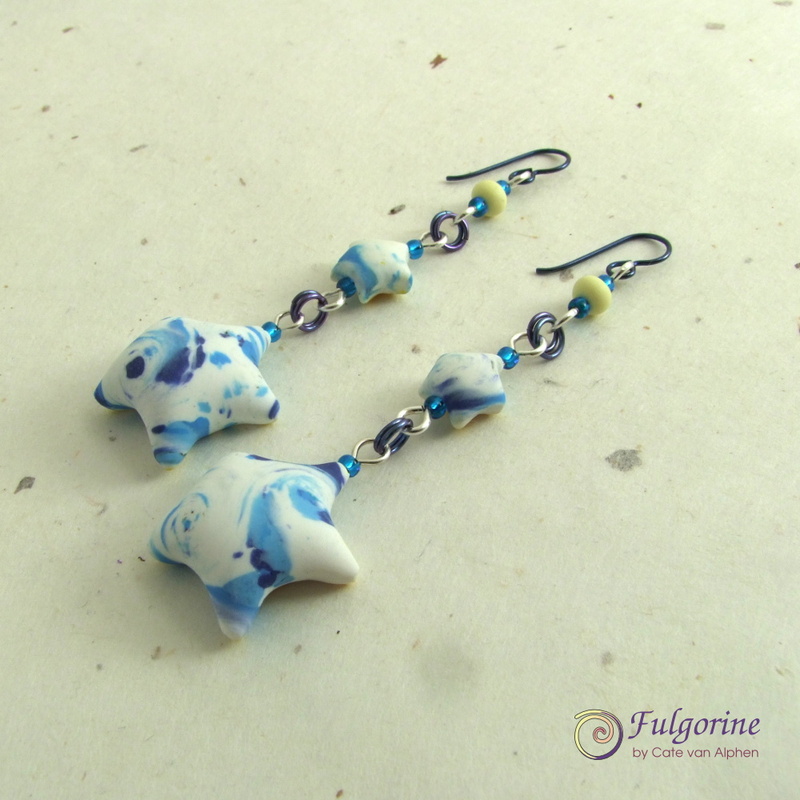 The first pair of earrings is smaller and the beads are more regular. I paired them with green crystal cubes and seed beads on niobium pins. 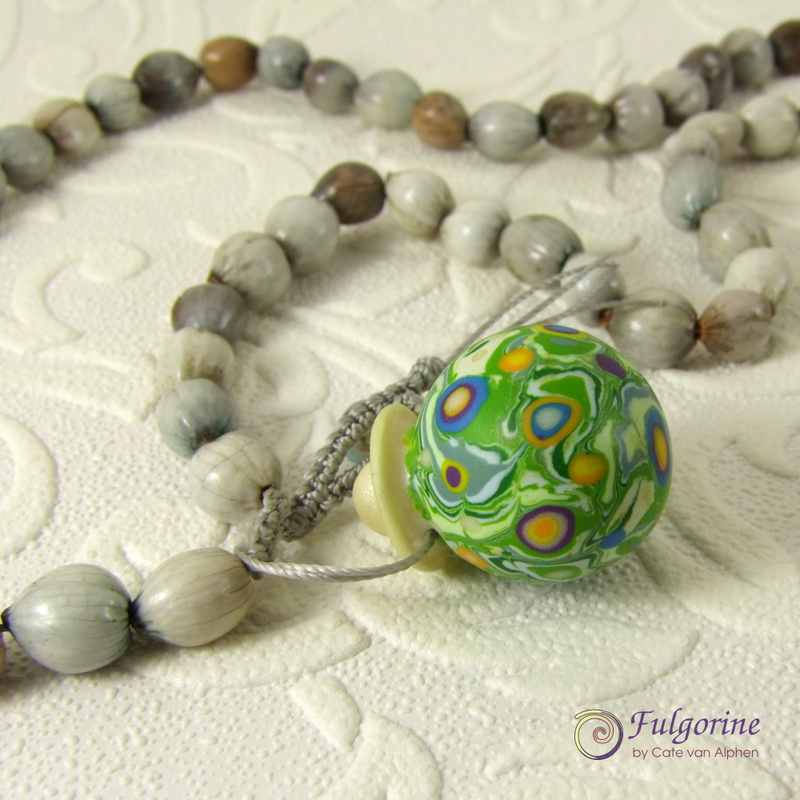 The second pair of beads I made were more organic and irregular. They reminded me of seed pods. I made them into longer earrings with a leaf charm at the bottom. 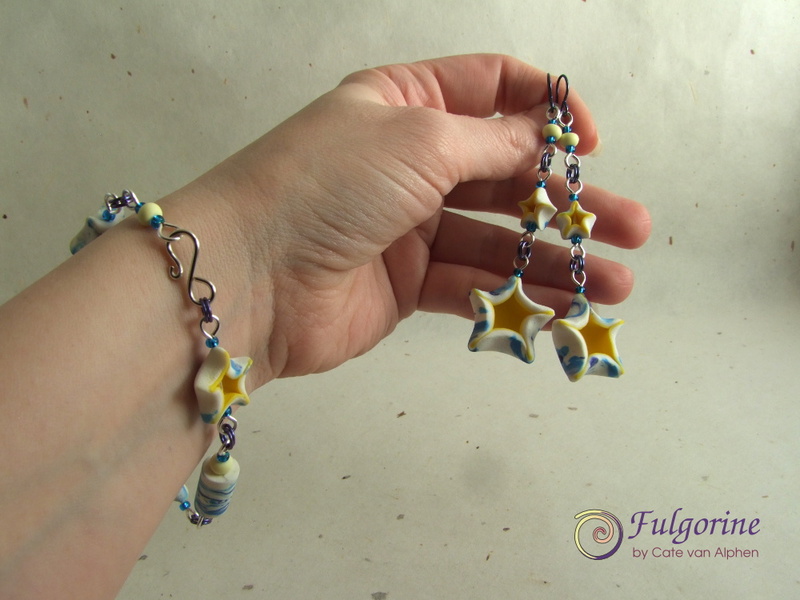 This week for my 2016 Polymer Clay challenge I have a sneak peek of a lantern that I’m making and another ballet-time bracelet. I decided to do another lantern since the previous one I made was a bit disappointing when illuminated. This time I’m using glass nuggets so it should be more exciting when lit. I’ve only completed a small section, but it’s promising. I just hope it will hold together when I’m done since I’m intending to leave some gaps. 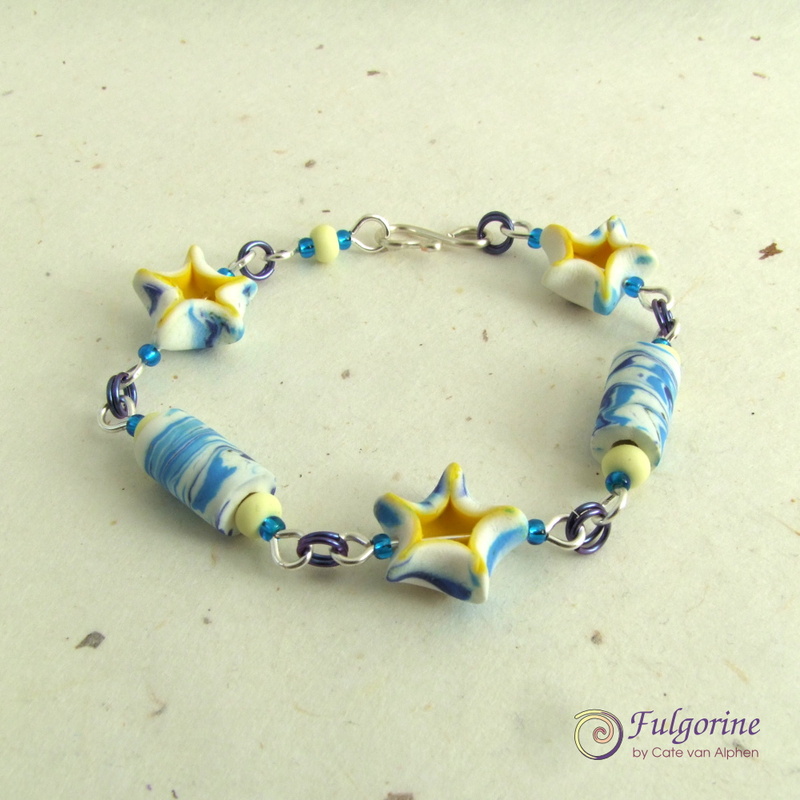 I used beads from last year’s Yellow Palette to make this bracelet. It’s available from my Folksy shop. This week I have decided to alter the parameters of my challenge – because it’s mine so I can! Last year I tried to do my weekly blog on a Thursday, this meant I could play on Friday evening because I didn’t “have to” finish something off for the challenge. My vessels are taking longer to make than I expect, which is fine because I love doing them, but now I am trying to simplify my ideas to fit them into a self-imposed timescale of a week. I’m not enjoying the stress and I don’t believe artists get bonus points for how quickly they work (unless you use the time is money* equation). I am now also using the beads I made from last year’s challenge to make finished pieces of jewellery. I do this when I’m waiting while the girls do ballet etc. so it comes out of a different time budget. 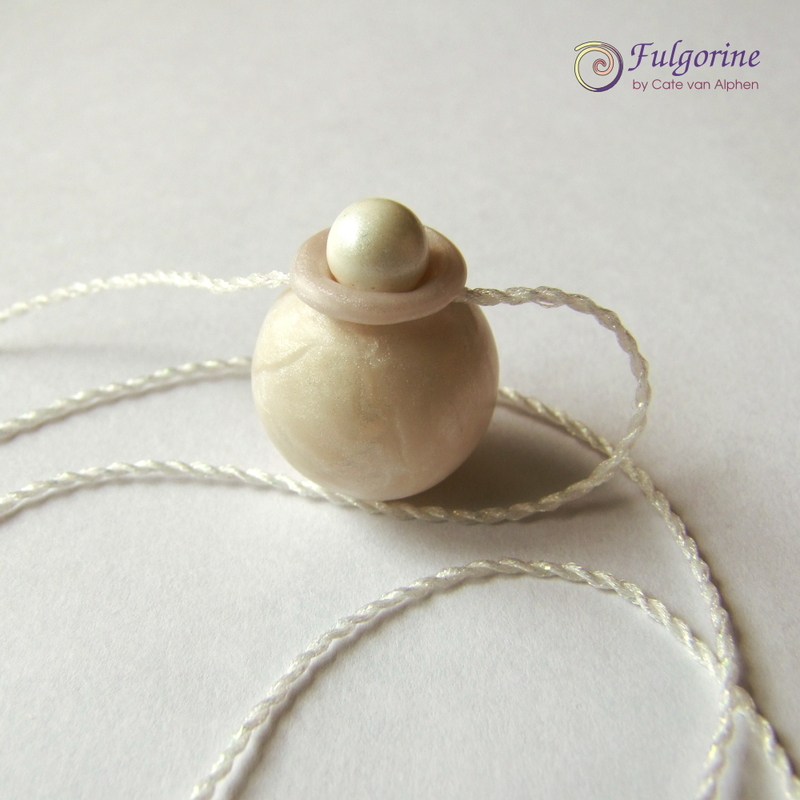 Therefore I have decided that my challenge will now be as follows: I will work on my vessel each week, and if it is not finished within a week I will post some of my ballet-time jewellery instead. Maybe by the end of the year I’ll be able to work quicker and more efficiently and have a vessel completed each week? But for this week it’s a ballet-time bracelet. I used beads from my Orange Palette for this bracelet. I made the red stick beads specifically for it after pairing the square retro beads with the gold pearls. You can find it in my Folksy shop. * I don’t think money is the best measurement of an artist either. 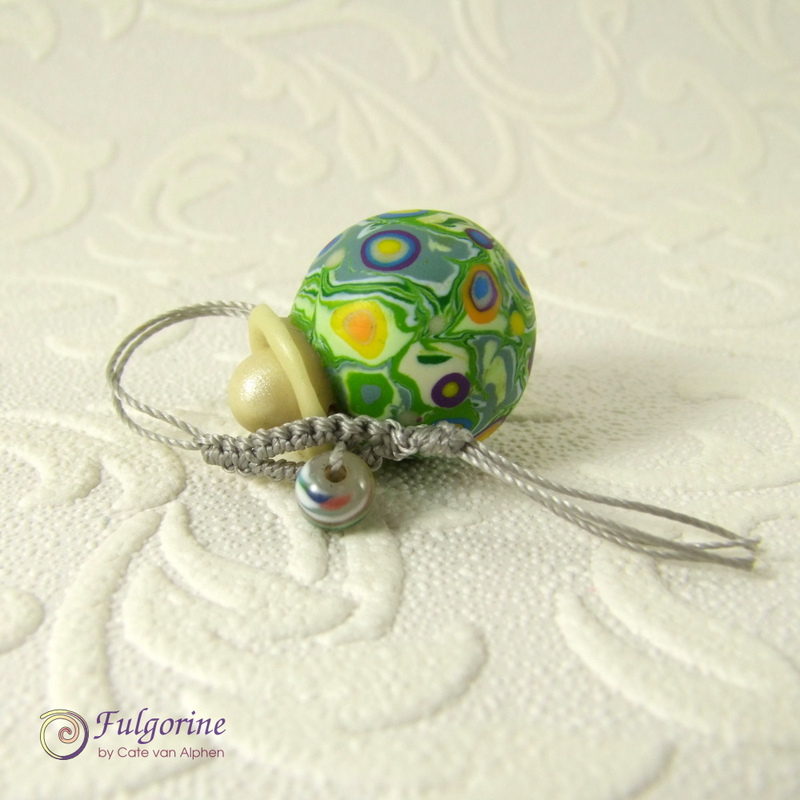 As my girls would sing “For the first time in forever…” I have made an entry for the Art Bead Scene monthly challenge. I do follow along every month and usually plan something, but I don’t often get to sit down and make it. In the end I didn’t use the third star charm and I now have a bowl of beads waiting to become something when they grow up. The bracelet ended up daintier than I planned. 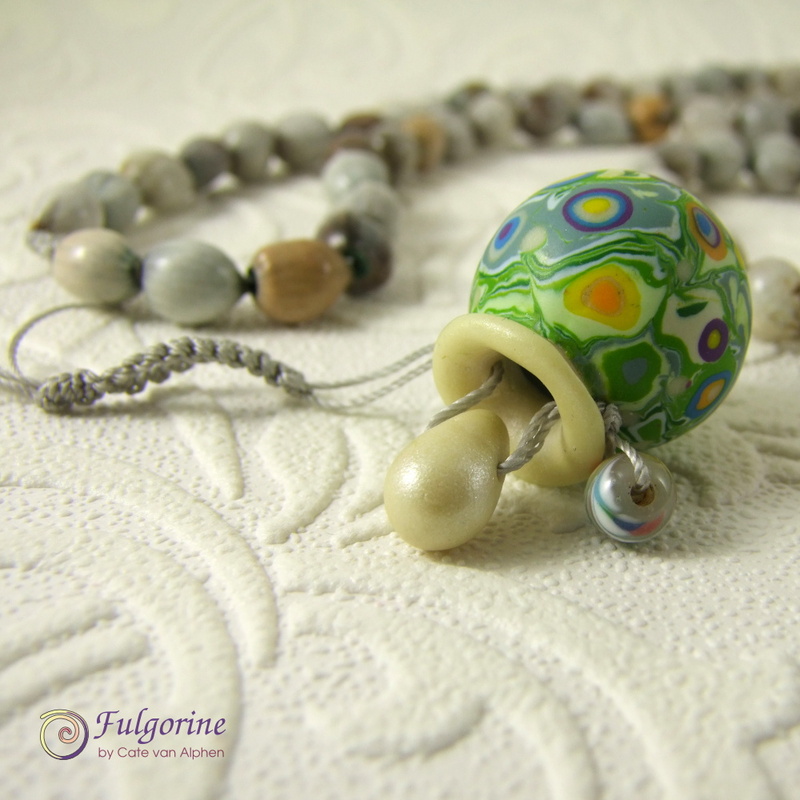 The chunkier beads in the bracelet irritated me – I think because I use my hands a lot. 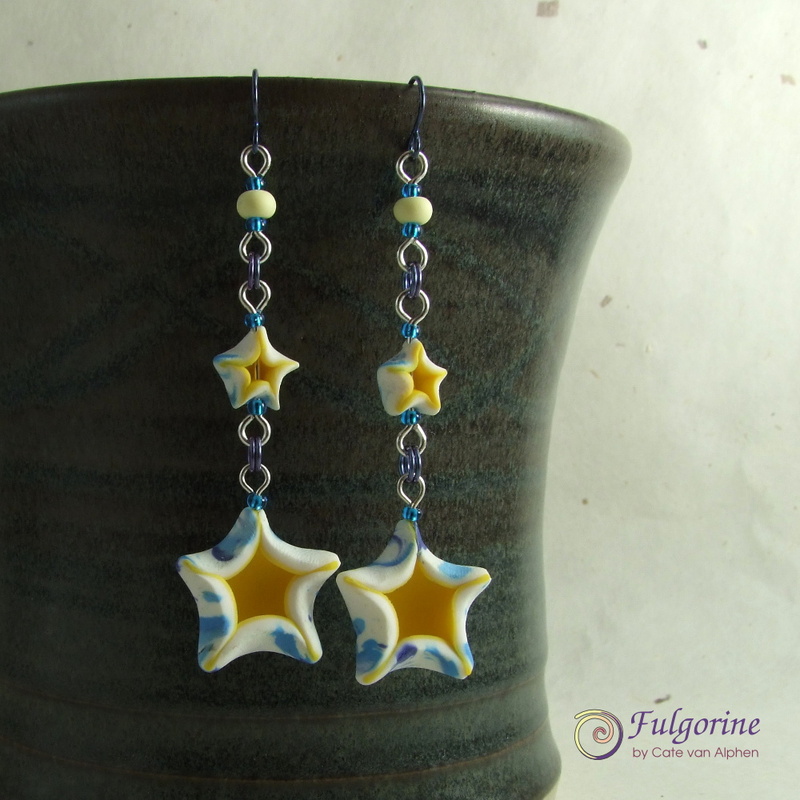 Initially the earrings were just supposed to be the large star charm on the bottom hung from an ear-wire, but they grew. 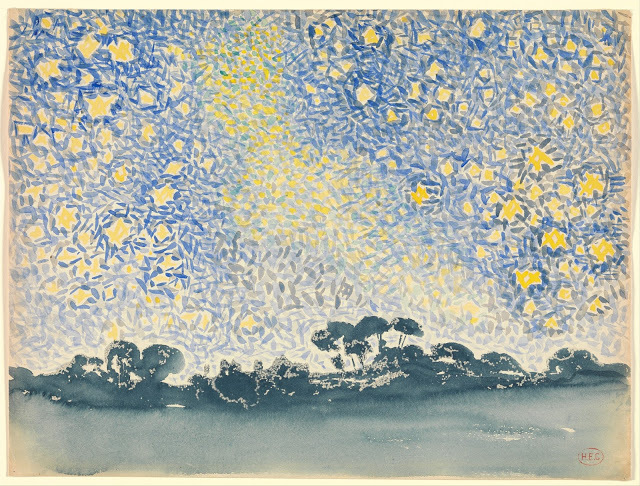 The back shows a little cross-pollination with Van Gogh’s “The Starry Night”. 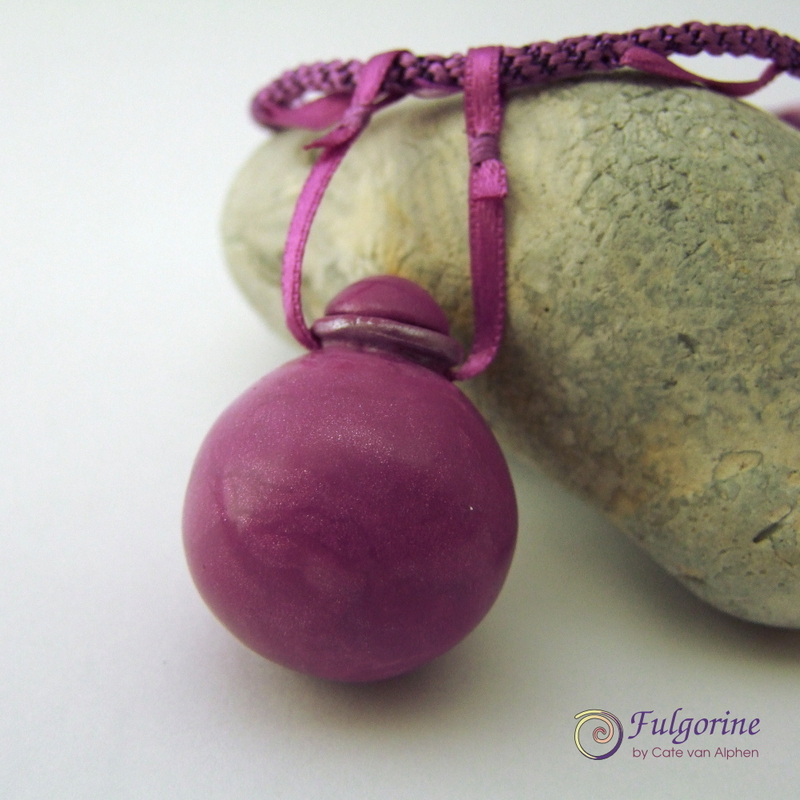 This week I made some red spacer beads for my 2015 Polymer Clay Challenge. I did make some more interesting beads using the scraps of the purple palette left on my board, but since they aren’t red I’m not counting them officially. 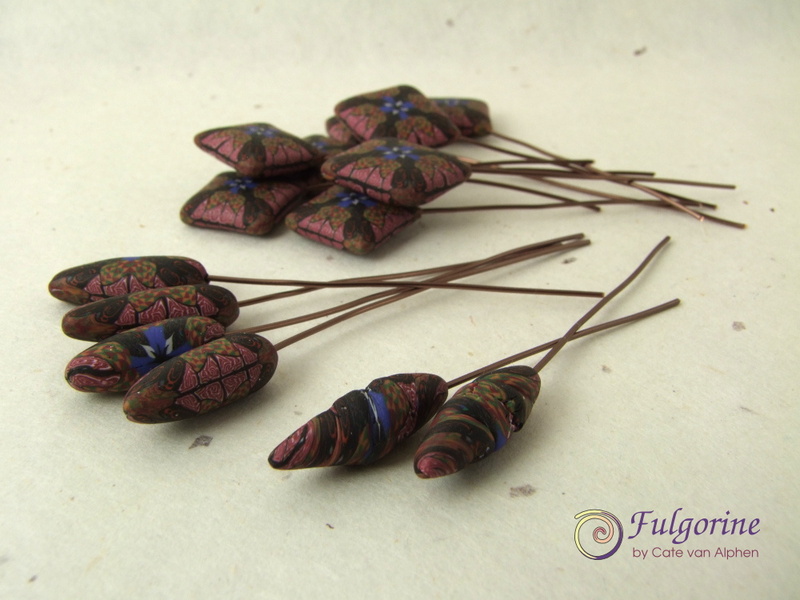 It’s a lucky coincidence that I have something for this month’s Art Bead Scene challenge. 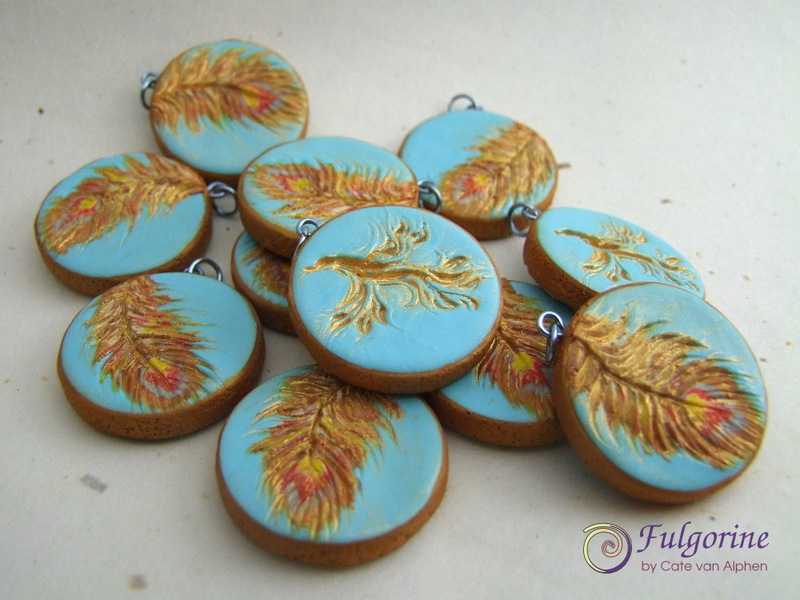 I’d just made a pair of earrings to co-ordinate with the Bronze Oddment necklace I made a while ago and, as I was uploading them to my etsy store, I realised the colours were perfect for this month’s painting. Here are the earrings. 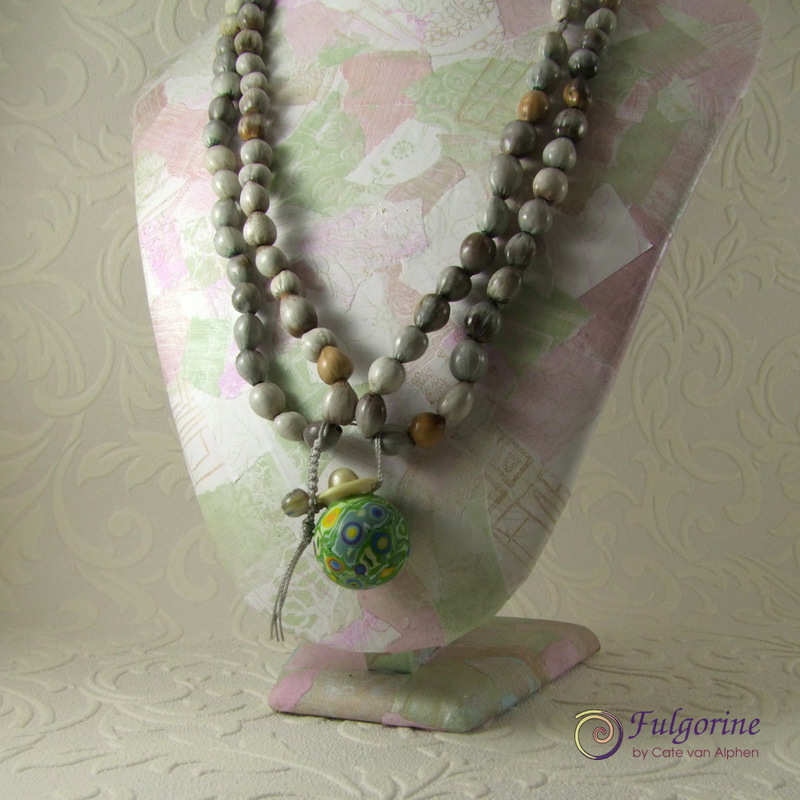 I used polymer clay beads which I made myself together with glass seed beads. 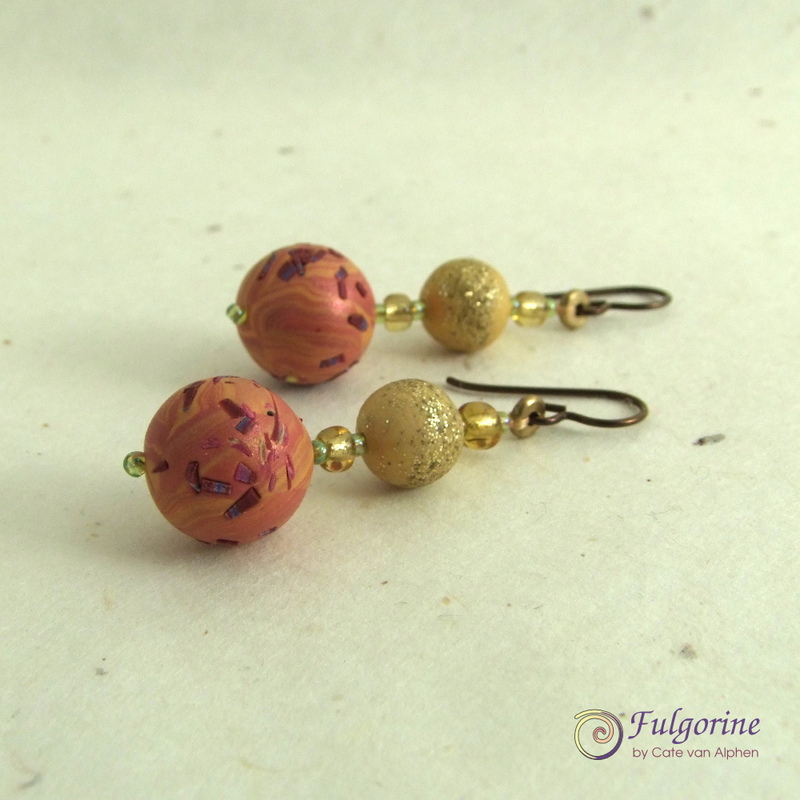 They are attached to tiny brass washers I found in an old bracelet and bronze coloured niobium ear-wires. 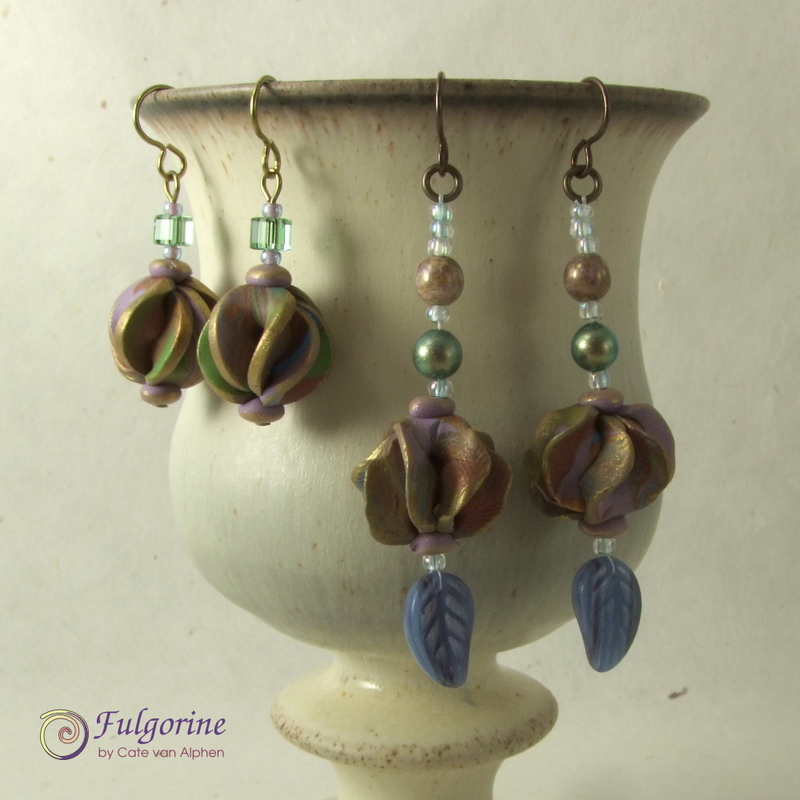 I like how the shards of polymer clay suggest the falling leaf motif of the curtain. 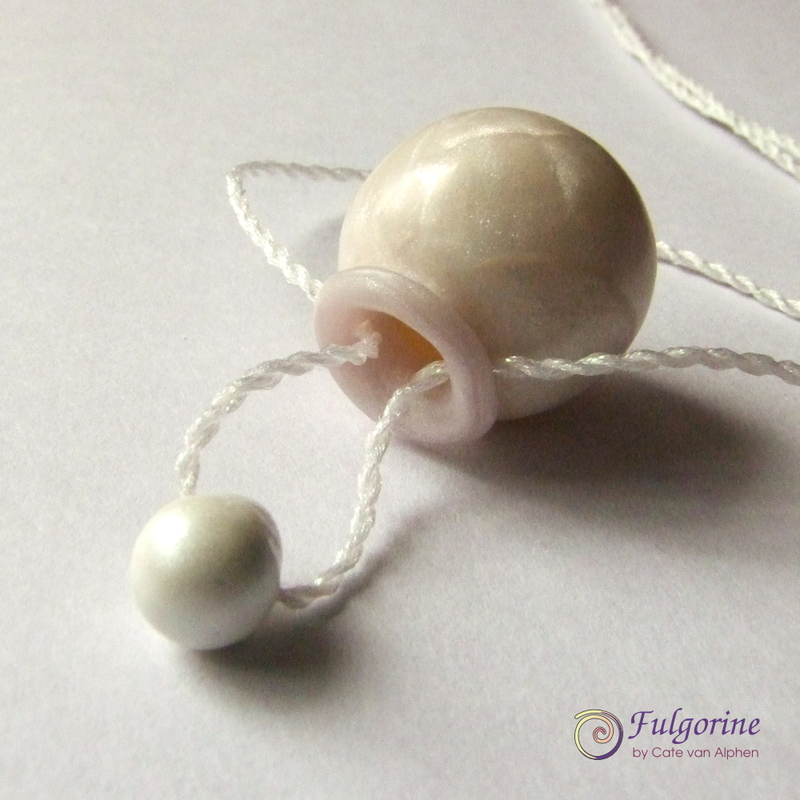 And here’s a new image of the necklace they were made to co-ordinate with.